Now, everyone knows how hard Teachers work and how short of time they are, so ACE has been racking its brains to come up with a type of Contest that would stimulate Teachers intellectually, not take too much time or effort to do, and, of course, enable them to win some prizes. So, during the academic year 2005 / 6 , we came up with the idea of IMAGE CONTESTS - which involves having numbered images on a website and besides each image are posted questions which require answers of only one or two words... and these one or two word answers could be easily sent to us via email in a list next to the question number. We have to thank Stephen Arnold a British history buff and published photographer, as well as a close friend of ACE, for his infectious enthusiasm right from the start, and the fascinating items which he brought back from his travels and sent the winning Teachers. 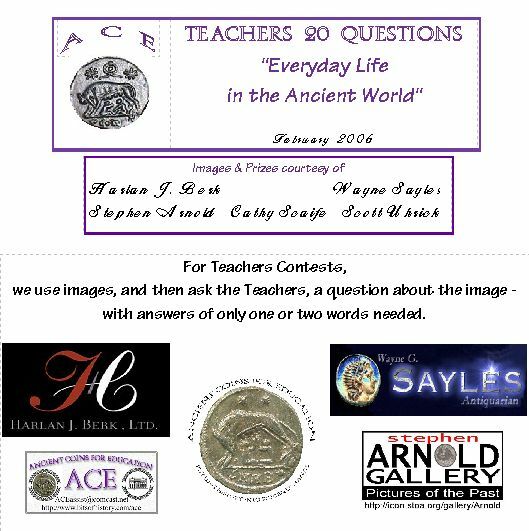 On the coin side, our long time friend and ACE Supporter Extraordinaire, Harlan J Berk, came up trumps with coin prizes for our Teachers, and wonderful images of ancient coins and artifacts to test their knowledge. The Answers? - you have to apply to ACE ! This is the amazing Teacher - Nicole Diamente - who teaches in Chappaqua, NY, who won ALL THREE Teacher Image Contests with 100% correct answers....... and here she receives her Award and Roman silver coin from ACE Director, Scott Uhrick.... http://ancientcoinsforeducation.org/gallery2/main.php?g2_itemId=65 if we tell you that she studied the Etruscan language as well as Latin and Ancient Greek, you will no doubt be as astounded as we were!